Amber beers or ales are a bit darker than the more-common lagers, with a taste that the niche magazine "Beer Advocate" describes as maltier than other hop-centric types. The toasted malt flavor combines with a fruitiness in most cases. Amber beers can range from a light amber color to a deep red. "Beer Advocate" says that "any beer less than a dark ale in color" qualifies. The alcohol content tends to range between 4 and 7 percent. Typically, 12 oz. of amber beer has 160 to 170 calories. Some specific brands include Fat Tire, with 160 calories; Red Hook ESB, with 179; Flying Dog Old Scratch, with 154; Michelob's Amber Boch, with 166; and the French brand Fischer, which has 172 calories. A few brewers give consideration to lovers of amber beer who want to watch their calories. Leinenkugel's Amber Light has 110 calories in 12 oz. The amber style of Miller Lite's Brewers Collection has the same amount, Weinhard's Amber Light has 135, and Michelob Ultra Amber Light has just 96. 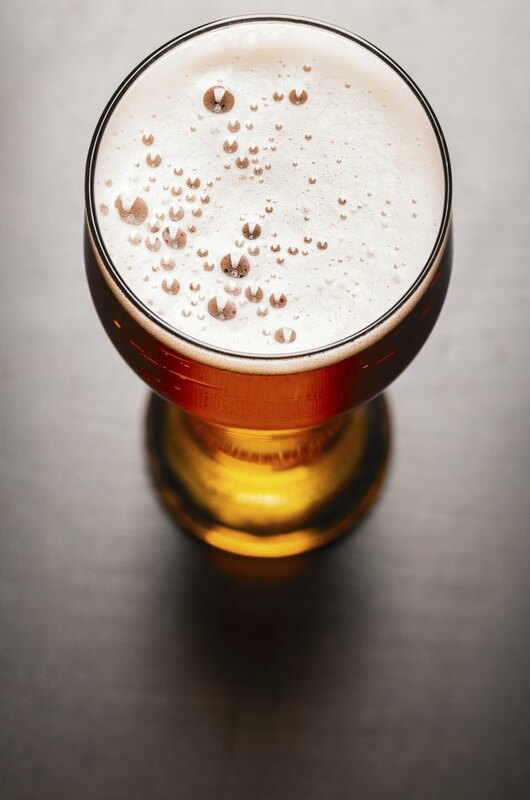 Amber beer has no fat, but can run high in carbohydrates. Twelve ounces of Fat Tire has almost 14 g of carbs and Old Scratch has 10.5. On the lighter side, the Michelob Ultra Light has just 3 g of carbs. In all of these beers, the carbs come from sugars; there is no dietary fiber in amber beers. Beer100.com: How Many Calories in Beer?